I was given a pasta machine as a gift from my mother a while ago but somehow never got round to using it. Until now! Last night we were child free (I know!) 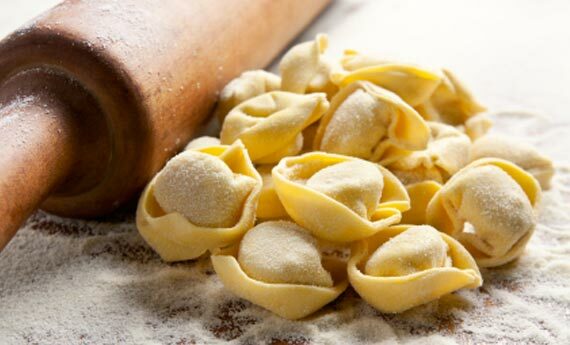 and decided that we would be brave and chose tortellini as our first foray into the pasta making world. We settled on a stuffing of chestnut and sage with caramelised red onion with a bit of parmesan cheese to bind and also thought if we were going to go to these lengths the least we should do was to make a fresh tomato sauce rather than one made with tinned variety. We made the filling and sauce first so that we could then concentrate fully on the pasta making! Making the tortellini themselves was fiddly and our first 2 attempts were a bit untidy! But by the time we’d made the full amount we were making very professional looking morsels. But that’s not the main point of this post. I’d love to hear more about people’s experiences of flow, how does it happen for you? What are you doing? When did it last happen? and I suppose, how can we make this amazing state happen for us more often?